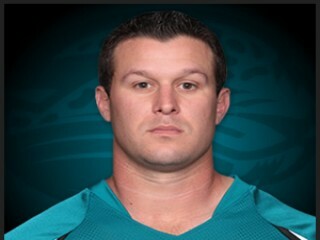 Jeremy Robert Cain is an American football linebacker and long snapper for the Jacksonville Jaguars of the NFL. Appeared in five games as a rookie and had two tackles and one special teams tackle … Originally signed by Chicago as an undrafted rookie and spent first part of the season on the club’s practice squad … Made NFL debut on 11/21 vs. IND and recorded one special teams tackle. Two-time All-America selection … Two-time candidate for Buck Buchanan Award, given annually to I-AA’s top defensive player … Ranked fifth on school’s all-time list with 363 tackles … Earned degree in hospitality from Isenberg School of Management in May 2004. Single … Resides in Ft. Lauderdale, Fla. … Attended St. Thomas Aquinas High (Ft. Lauderdale) and earned all-state honors as senior LB/LS … Has uncle, Ron, who played at Kentucky and spent time with Denver in 1960 … His uncle, John, also played at Kentucky … Would like to get into real estate following his football career … Took part in the NFL’s business education program at Wharton School of the University of Pennsylvania in 2008 … Visited Jacksonville Country Day School and signed autographs for students … Born in Boynton Beach, Fla. … Full name: Jeremy Robert Cain. View the full website biography of Jeremy Cain.